Please refer to our stock # DSC15 when inquiring. These lovely antique earrings are made from gold fill metal and are 1 1/2" long x 7/8" wide. 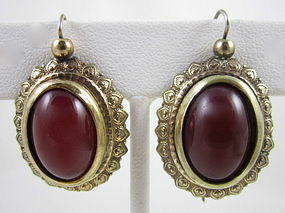 They have a 10 x 15mm oval carnelian cabochon mounted in an ornate repousse frame. They have a beautiful patina and are in very good condition.